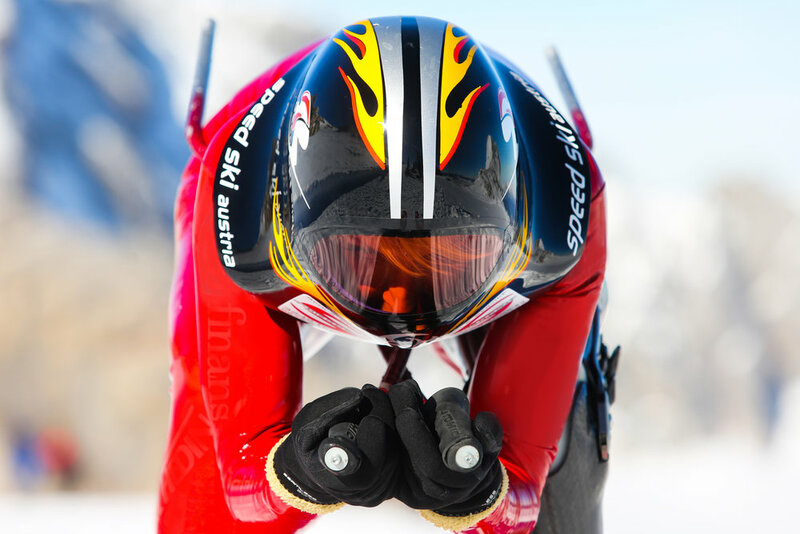 Appearing in The Jump inspired adrenalin infused athlete Heather to make history. If you happened to miss the 2nd series of the celebrity alpine competition TV show, The Jump, then here are a few facts on how Heather got on. First event was The Skeleton. Heather was the fastest in the training but came 2nd by a nano second to Olympian and Commonwealth Games gold medalist, Louise Hazel. Due to the new format in the 2nd series and although Heather was 2nd fastest overall from the girls group, she had to Jump on the 2nd show. The ski jump being the eliminator. Unfortunately in training her prosthetic foot broke, it was not made for jumping as no leg amputee had ever become a ski jumper and we are not talking about a ski slope jump, we mean as in “Eddie the Eagle” jump. As it was very last minute Heather called around and a friend located a foot that an Austrian gentleman had 3 hrs away from the event being held in Innsbruck. How generous loaning someone your foot, though a little big!!! With very little time to test the foot out, Heather had to attend her ski jump training session. Heather started at a comfortable level on the baby run. After a couple of jumps with the new foot, she moved onto the middle jump with ease. She jumped off the middle jump and managed to land 12.5 metres. Loving the rush from the thrill of the ski jump and the message of inspiration it is to everybody with physical challenges, Heather decided that she wanted to prove anything is possible and jump from the highest ski jump at Natters ski jumping area in, Innsbruck, Austria. Heather was the first girl, in training to attempt the middle jump inspiring her co-competitors to try it later. The big jump is a steep run on metal slates that can see the jumper reaching a speed of 70kph or more. As you reach the end you are propelled into the air on 2.20m fat long skis, crossing your fingers you will land it. None of the other celebrities, other than Mike Tindell (ex England rugby captain) and Steve-O (of Jackass fame), who crashed on landing and Louise Hazel, had attempted the big jump. Heather did and was soon to find out she had made a world record!! James, The Jump coach, who had step by step guided the celebrities during the show on the techniques of ski jumping, was with Heather during the 2-hour record-breaking session. The camera’s were there following her every move, hoping that this would be the day that James, would clear her to go for the big one. Finally, the waiting paid off. Heather, after 4 jumps from the middle run, was then cleared by James to go off the big jump. Ascending the ice-clad steps from the middle jump to the big jump, Heather looked totally at comfortable. She maneuvered her way onto the holding bench, which in order to align the jump ski’s correctly before exiting she had to hang off by her hands. She could not start from a sitting position on the bench as the other competitors did, since her prosthetic foot has no ankle, which means it is in a fixed position. Due to this, the only way to get her ski’s to lie flat on the metal slates was to stand semi upright with her arms behind her holding onto the bar tightly with her hands. Watch Heather land this amazing jump here. She was the first person to jump with one leg and also the first to land 17 metres off the big jump. Heather was soon to find out she had made a world record!! Not bad for a chick with one leg. Heather has now achieved an amazing 5 world records in just 3 months!